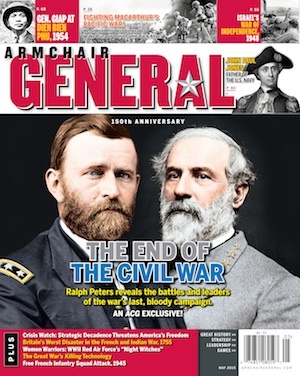 Gettysburg – Movie Review | Armchair General Magazine - We Put YOU in Command! "Gentlemen, I think if we lose this fight, we lose the war." These were the words of Colonel Joshua Chamberlain shortly before the first Confederate assault on Little Round Top, July 3, 1863. Fortunately, the stand made by his 20th Maine Regiment, among other units, on the key terrain of the Gettysburg battlefield’s southern edge prevented a test of this former college professor’s grim hypothesis. Union forces won this most important battle in the Civil War’s eastern theater. After more than a decade, Ronald Maxwell’s Gettysburg remains the big screen’s finest rendering of this watershed event. Certainly, no film before or since has managed to attain the level of authenticity or present the titanic struggle with better dramatic effect than Gettysburg, an adaptation of the late Michael Shaara’s popular historical novel, The Killer Angels. Often required reading at military schools such as the Army War College, National Defense University, and the Command and General Staff College, the book has attained the status of a "classic." The film version may be on its way to that exalted position as well. In July 1863, more than 85,000 Union Soldiers and 70,000 Confederate Soldiers fought for three days over the rolling hills of southern Pennsylvania at the tiny town of Gettysburg. The 53,000 casualties suffered there by both sides made the battle the bloodiest ever fought on American soil. Many historians argue that it marked the turning point of the Civil War. Certainly, it was the war’s turning point in the eastern theater since it was the last time that the Army of the Potomac’s nemesis Confederate General Robert E. Lee was on the offensive. For the cautious Union commander General George G. Meade, Gettysburg represented an opportunity to inflict irreparable damage on the Confederate Army. For Lee, the Army of Northern Virginia’s brilliant and much beloved commander, the battle was his last chance to draw the Union force into the open and cripple it, possibly setting the stage for isolating Lincoln’s capital, Washington, D. C., thereby permitting Confederate President Jefferson Davis to dictate terms for a favorable peace settlement. Neither commander deliberately chose Gettysburg as the setting for this titanic clash – the armies simply blundered into each other. On each of the three days it took the battle to develop, Lee had an opportunity to finish off his opponent. Yet he was unsuccessful each time. The final attempt – Pickett’s Charge against the center of Meade’s strong line – failed most spectacularly. Like a postscript to the battle, President Abraham Lincoln journeyed to Gettysburg the following November to dedicate a new national cemetery. His Gettysburg Address (recited in the film by Jeff Daniels as he plays Chamberlain) is probably, and most fittingly, the greatest speech ever delivered by an American president. Director Ronald Maxwell tells this story in a visually stunning fashion that is exceptionally true to the historical events and personalities. One need not be a lifelong student of the Civil War to appreciate the themes threaded throughout Gettysburg. As did Shaara’s novel, the film uses the battle to explore duty, patriotism, comradeship and devotion to a cause. Of these, perhaps duty is the one theme that stands out best in all its forms. Lee (played by Martin Sheen) has placed what he sees as his duty to his home state of Virginia over his duty to the United States and leads the South’s forces against his former comrades in arms (or, as Lee refers to his Union adversaries, "those people"). Finally, in what might be termed a "corporate" expression of Soldiers’ devotion to duty, 10,000 Confederate troops in a mile-long line step off at 2 p.m. on July 3, 1863, and march toward the center of the Union line a half mile away. Most know that the assault is likely to be a one-way trip. Yet faithful to their duty as Soldiers – and their duty to one another – the men go forward into the bloody shambles of Pickett’s Charge. Maxwell frames the story chronologically over the three-day period while depicting the action through the eyes and relationships of key players. The viewer feels Lee’s frustration with his flamboyant cavalry commander General J.E.B Stuart, whose untimely absence during the prelude to battle denies Lee vital intelligence and ultimately robs the Confederates of the high ground – and yet one can’t help but marvel at Lee’s self-control during Stuart’s midnight "counseling session." And for insight into what motivates Soldiers – even today’s Soldiers – pay particular attention to Chamberlain’s low-key entreaty to the 120 mutineers from Maine’s 2d Regiment: "What we’re fighting for, in the end, we are fighting for each other." Yet awesome combat scenes aside, the dramatic story is what holds the viewer’s attention. The drama surrounding the 20th Maine’s defense of Little Round Top on the second day of the battle is a prime example. After watching the Confederates assault Little Round Top repeatedly, each attack nearly breaking Chamberlain’s thin line, his audacious command of "Bayonets!" comes across as a powerfully dramatic portrayal of brave men in desperate combat. Seeing Confederate General Lewis "Lo" Armistead (the late Richard Jordan’s final role) lead Pickett’s men from the front and hearing Longstreet’s clairvoyant description of the event about to unfold helps viewers fully appreciate the futility, courage and remarkable dedication exemplified by Pickett’s Charge. In sum, Gettysburg is the best depiction of the carnage of combat and the drama of this brother-against-brother war – America’s most deadly conflict – that filmmakers have yet put together. Gettysburg is the most written about battle in American history. Some of the best of books on the subject include the excellent historical novel, The Killer Angels by Michael Shaara; Gettysburg by Stephen W. Sears; Hallowed Ground: A Walk at Gettysburg by James M. McPherson; Lost Triumph: Lee’s Real Plan at Gettysburg – and Why it Failed by Tom Carhart; The Gettysburg Campaign: A Study in Command by Edwin B. Coddington; and Lincoln at Gettysburg: The Words That Remade America by Garry Wills. Lieutenant Colonel (Ret) David Cavaleri is a published author and holds a master’s degree in history. He currently works for the Department of Defense. Absolutely the best civil war movie – hands down!